Saturday January 9- 1932 I did not get up very early. A cold day Ott was here for lunch. I wrote Winnie & Birdie Hatten. Cora here a moment in the AM. Tishie & Elaine late in PM I felt quite good all day. But not so well in evening William & Mary here to call Mrs Gay & Aunty up too Sunday January 10- 1932 Weather better. Rob came in a moment to show me his new air-dale dog Ott stopped after church and left the folder. They have changed it, taken the church picture from the front. I read & slept some. I have put in a day of suffering. Ott went to Chicago on the PM train. The Whetstones took a ride down to Stevens Monday January 11- 1932 I felt badly today Hattie came down with Rob. Later Dr Ned Smith came to give me a treatment. Hattie went to Home board meeting with Mrs Gay in PM Mary Ilo & Buddy here. Hattie went home with Rob. letter from Cal Eggleston in Boise Tuesday January 12- 1932 I felt wretched all day. Hattie has cold and did not come down. Letters from Ella Nagle and Ida I wrote to her and LeGrand. 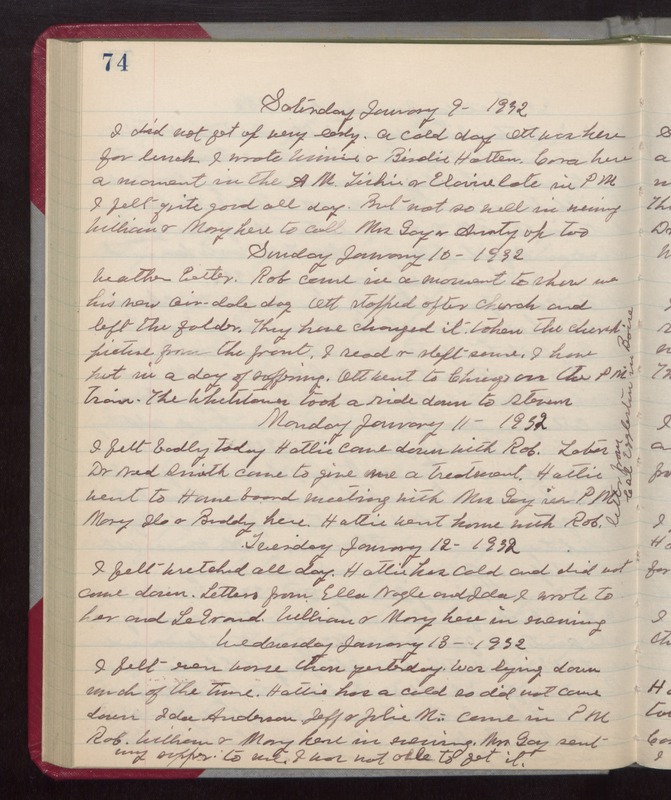 William & Mary here in evening Wednesday January 13- 1932 I felt even worse than yesterday. Was lying down much of the time. Hattie has a cold so did not come down Ida Anderson, Jeff & Julie M- came in PM Rob, William & Mary here in evening. Mrs Gay sent my supper to me. I was not able to get it.